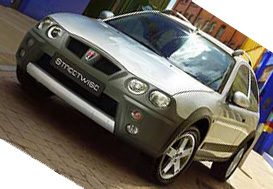 The Rover "Streetwise" (below) has just been launched by MG-Rover along with it's little cousin, the "Citycar" Both model ranges are already on sale. This new "Urban on-roader" based on the 25, it's a kind of spoof off-roader like the Renault Scenic RX4 and it looks great, It's a don't-mess-with-me-buddy kind of machine. This model boasts a raised suspension, larger wheels, roof bars, more aggressive bumpers, wheel arches and side rubbing strips which all contribute to the tough appearance. Inside, the Streetwise cars have blue instrument graphics, four separate sports seats as standard a rear bench seat is however an option. Plenty of stowage spaces. There are a number of engines in the range and thankfully a 1.8 K stepspeed will surface too. X Power SV. Following development of the original X80 concept, the MG has been radically evolved, is lighter and has increased levels of power with up to 965bhp. So extreme is the performance that all models will be marketed under the MG Sport & Racing XPower brand. The exterior styling of the two-seater MG sports car owes much to the demands of airflow management required for competition cars. These elements give the car an aggressive and overtly sporting stance implying its potential for high performance. Targeted at the premier driving enthusiast, the new SV will become the icon of the MG brand with opportunity for both road and track exploitation. Peter Stevens, MG Rover Group's world renowned product design director, previously with McLaren, Lamborghini and Lotus, has been appointed managing director of a new company specially formed to produce the MG XPower SV. Rollover protection is provided by a tubular structure designed to comply with current FIA competition specifications. A rigorous development programme including high-speed stability tests at the Nardo circuit in Southern Italy saw the MG XPower SV regularly exceed 200mph (320km/h). MG XPower SV is a part of a unique range of products, which will ultimately be available with some of the most extreme levels of road performance ever offered. MG XPower SV The MG XPower SV range starts with a car powered by a 326bhp 4.6-litre quad-cam V8 engine. approximate performance figures of 0-62mph (0-100km/h) in 5.0 seconds and a top speed of around 170mph (273km/h). More specification details will be released during the spring of 2003. As part of the project's weight reduction objectives, all body panels are made from lightweight carbon fibre. The flat underfloor and inbuilt front and rear diffusers manage the aerodynamic airflow for high-speed stability. Suspension geometry has been designed in collaboration with Steve Randle, responsible for the dynamic set-up of the McLaren F1 road car. 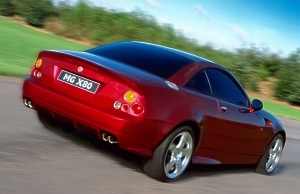 Well chaps, this is the MGX80, MG Rover have entered into an agreement to purchase the assets of the Italian subsidiary of Qvale Automotive Group. Based in Modena, Italy employing 70 or so staff, it manufactures the Mangusta Coupé. With the outstanding chassis and engineering of the Qvale project, coupled to a 4.6 litre V8 powertrain producing up to 380 Ps, MG Rover has desiged a new luxury high performance sports car. Styled by MG Rovers world renowned design director Peter Stevens. 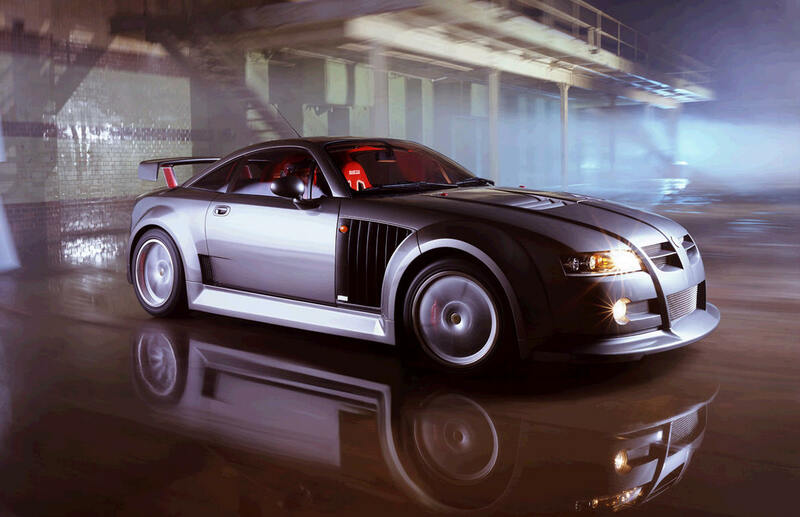 To be launched in 2002 this car will give MG Rover a world class product in the high performance luxury sports car sector. Both coupe and roadster versions are planned with manual and automatic transmissions. The new car will be positioned above the existing MGF roadster, the new MG sports saloons and sports-tourer. Kevin Howe, chief executive of MG Rover said: "The MG X80 will be an excellent fit at the top of our family of MG cars. It also provides an opportunity to look at markets where we are not currently represented. In particular the USA market, the worlds largest sports car market, where we can now seriously evaluate the full potential for the MG brand." 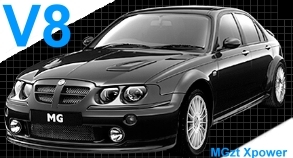 Bruce Qvale, president of Qvale Automotive Group said: "MG Rover showed an interest in our Mangusta car project in Modena and we have agreed a good deal for both sides. 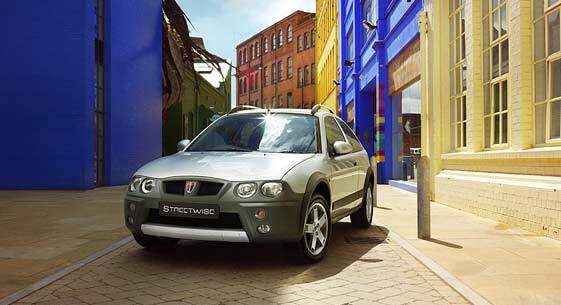 The power of the MG brand now takes the project forward on a global basis." The MG ZT Xpower version based on the Rover 75 Saloon, is currently aimed and poised to be on sale in May 2002, it is the 'all out' top end ZT in terms of street legal performance. Projected specifications show that this car will be equipped with: Six speed manual 4.6 V8 engine developing 385 Ps, Quad outlet exhaust system, 18x8.5" Alloys that are wider at rear (by 1"). Multi link rear suspension system, Xenon auto leveling - power wash headlamps, Starter Button etc. Sadly although this vehicle is street legal it won't apparently be going into consumer production, it was designed to compete, a true racer developing 500Ps thru its XP-20 Rear mounted (Transverse) development engine. The same beast that powered the EX257 at Le Mans in 2001, with Rear wheel drive, Xtrac gearbox and AP Four-pot brakes, the machine has unbelievable stopping power and speed.